In the last article, I talked about getting video into DVDSP. This time, we’ll look at making a menu with Photoshop, and some interesting things that happened when I tried to use markers. In Photoshop, I created a file with a background and a title for the page, “Songs.” I then made individual text boxes for each song, and their rollover states. Once this was complete, I imported the file into DVDSP. Creating the buttons is pretty easy: just draw a button, designate which layers are for highlight and down state, and link to the video (Screenshot). So I had the one large video file; I followed by putting in markers (Screenshot). Markers are what allow you to jump to a specific point, creating what in DVDs are usually called chapters. The interface for placing markers is pretty intuitive, if not highly precise. You move a slider along the video window, then name the marker. If you want to be frame-accurate, however, you have to type in the time code; there are no zoom functions, and the slider is only accurate to about 45 frames or so. Once all of the markers were made, I then referenced them from the appropriate buttons. Go into preview mode and ... a problem. It turns out that when you encode the video as MPEG-2, DVDSP doesn’t encode it again. This actually makes a lot more sense, since you never want to compress a file twice. I confused this with how iDVD works, because that program does the encoding. When I tested the menu I made in DVDSP, it went to the spot but wouldn’t play the video because the data rate was too high. In other words, for the default DVD disc size (4.7GB), there was too much video (6GB). Okay, so I had to use a smaller size. I chose a quality of about 6.6, which resulted in a 4GB file. As many of you probably know, the smaller you compress a file, the longer it takes to encode. In this case, it took almost 5 hours to complete. This is on a G4/450, though, so your mileage may vary. Once I had the smaller file, I replaced the previous one. I clicked on the link, and it played! (Screenshot.) But wait – there was still a problem. When played in FCPro or when previewed from the beginning of the disc in DVDSP, the video is perfectly synced to the audio. However, when the markers are used, the audio loses sync – and it gets worse the further out you go. After contacting Apple support and going on their message boards I learned that it may be a problem in encoding. Unfortunately, I only have the software Apple gave me, which should work and not cause this problem. All is not lost, however. I was told to try and build my DVD to disc, then use the resulting file to preview. I did this (it took about 30 minutes) and lo and behold – the built DVD did work! I don’t have a DVD-R, but I feel pretty comfortable going to the step of making a test disc. Still, it’s a little disconcerting. Apple should definitely fix this issue. Now that I have DVDSP 1.1 and QuickTime Pro 5 installed, a few things have changed. Although I haven’t done extensive testing, it seems that the issue with markers has disappeared. It’s hard to tell what the solution was, as I also now have Final Cut Pro 2, and I am doing as some folks on the message boards have suggested – I work in FCP, then export as an FCP file (I do not make the movie self-contained, as that takes a lot more time and hard drive space) and then open the movie with QuickTime Player and export the video to MPEG-2 format with that app. This combination seems to make everything work just fine. 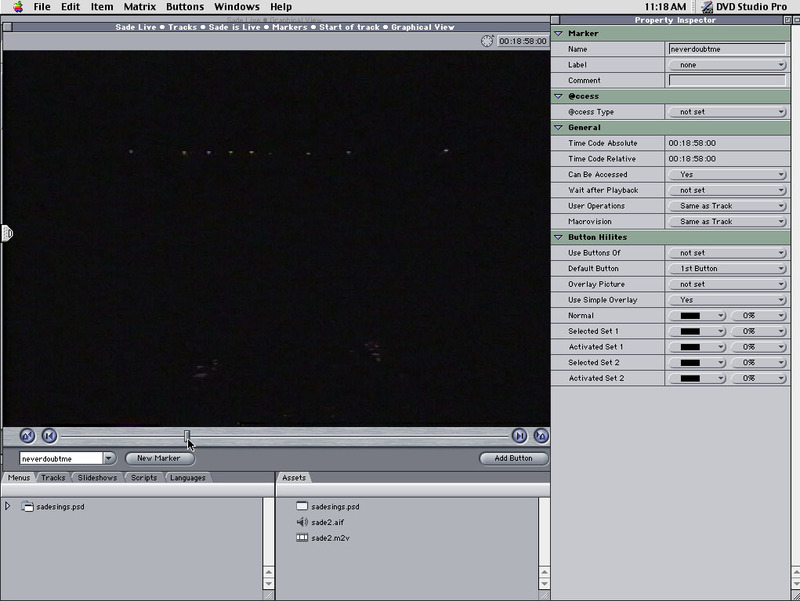 The video and audio are in sync in preview mode and in the DVD-Rs I burn, even when using markers. Now, though, it seems that DVDSP will not recognize files encoded at 9.8 in MPEG-2 when using QuickTime to encode, regardless of size. I am making a demo CD for my band (Toasted Head) consisting of only two songs taking up a total of about ten minutes, plus menus. When encoded at 9.8 quality, DVDSP tells me the files are too big when clearly they are not – they take up only about 1.5GB. It seems that I have to set the quality below 9 (although I haven't done a scientific survey) before DVDSP will recognize that the file is okay. Finally, I discovered a neat little trick for menus. I had thought that the button area defined which part of the Photoshop layer would show. But the button box is really only meaningful to computer DVD users – it simply defines the highlight point and relative order of the buttons. So technically, you can change the whole screen for rollovers. I used this to my advantage in my band's DVD, by having over half of the screen change and having some buttons’ rollovers provide the info right there instead of making an additional menu. Play around with this and you’ll see what I mean. Next time, we’ll talk about making motion menus for a DVD, and how to set up your DVD’s defaults. Eliot Hochberg is a Web developer with over 6 years experience. Apple’s new professional tools are just the ticket for a sole proprietor like Eliot to go to the next level. Right now, he’s seeking DVDSP duplication services that support DVD Studio Pro. If your company does, let us know. We’ll list you in future articles.